A quick glaze of French Ultramarine Blue in the sky and - Ta Da!!! After a lot of "tweaking" around this piece, it is finally complete! Hope you enjoyed it. I know I did. This piece will be for sale soon (we need to mat and frame it!). You can learn more about purchasing my work by visiting my online etsy store. 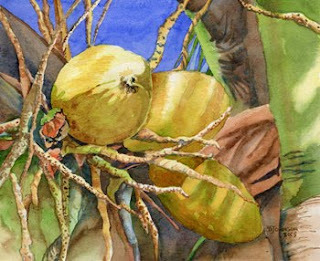 If you are in the Melbourne, Florida area and would like to learn more about my drawing and watercolor classes, please visit my website. A new lesson will be posted soon. I am also beginning to plan my upcoming art show season. You can find out more about the shows I'll be in on the Events page of my website. Stay in touch - become a Follower. You can see my work locally at the Art and Antique Studio Gallery in the Eau Gallie Art District (EGAD! ), Melbourne, Florida. Click the studio name above to visit their website.